Susan Bremer O'Neill has been a pioneer and trail blazer her entire life. Though her journey has been hard at times and daring at others, through it all she’s emerged a thoughtful, prodding, truthful, observer of life and she inspires and motivates audiences to look deeper into their own beliefs and encourages them towards their own success as women in today’s world. Susan Bremer O'Neill inspires every woman to be all she can be. Whether you want to gain more energy, make more money, or have more romance, through her Self Appeal® message of building a positive nurturing relationship with one's self, you'll learn how. Her interactive presentation along with her inspiring and honest account of her own life as a scientist and exotic dancer motivates and gives tools, tips, and techniques to help you embrace your body and mind and feel good about who you are so you can affect positive change in your life. Book Susan for your next event! At a time when bodies and minds are easily influenced and changing, Susan Bremer O'Neill speaks honestly about self-care, self-love, relationships, substance abuse, safety and sexual self-respect. With insight, experience, wisdom, interesting stories, and fun activities, Susan guides adolescent, high school and college women to experience their body and mind in unique, positive ways that promote improved body and self-image emphasizing internal focus and leadership for happy, successful lives. Business women are concerned about mechanics but often neglect how attitude and energy affect business. 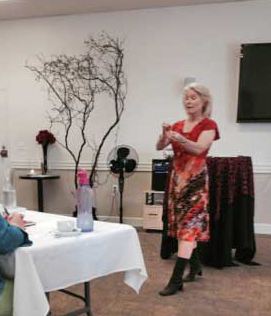 Susan Bremer O'Neill's entertaining, thought-providing programs inspire women to tap into themselves for the courage, confidence, and answers they need to take the next steps to succeed in business. Susan is a dynamic speaker who's dedicated to the empowerment of women in life and business. Her presentations have moved thousands of women to feel good about themselves and uncover secrets for their success.